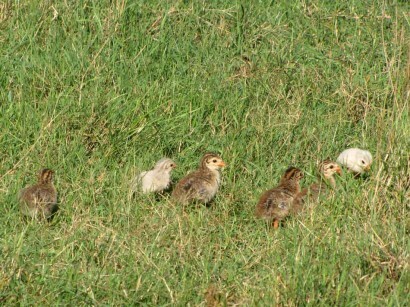 Strangely enough, the keets seem to shift parents. I mean, sometimes I’ll look out and see two gray keets with a group of guineas, and then another time they’ll be split up and following a different set of adult guinea fowl. Only thing I can figure out is they are roosting close together at night, and when they take off in the morning, the same keets aren’t always following the same adults. Then yesterday morning when I went inside the peafowl pen to put out some more food, two of the peahens were growling at me. All four of peahens are sitting on eggs. 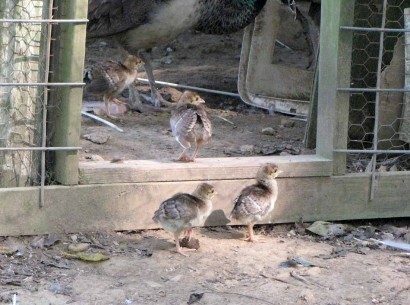 The two peahens in the back of the picture were the culprits. 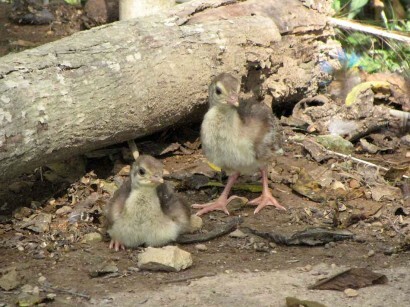 And since they only time I ever hear them growl is when they have chicks, I figured they must have at least one, even if I could see any. However, later in the afternoon those two hens were out in the aviary, and sure enough, they had a chick. As a matter of fact, they have TWO chicks. . . 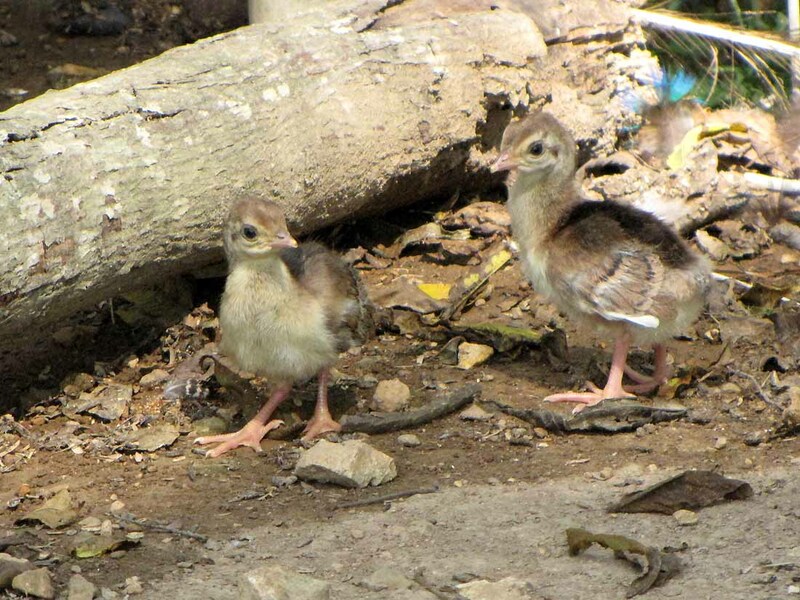 They scurry around after their mamas, but they also have an adventuresome streak. I’ve noticed before that peachicks have a tendency to be more curious and range further from their mamas than the baby chickens, or even baby guinea fowl. And I don’t feel so bad about not getting eggs to hatch in my incubator. I noticed there are half a dozen eggs still in the nest, though the peahens are still turning them, so I guess they aren’t done. 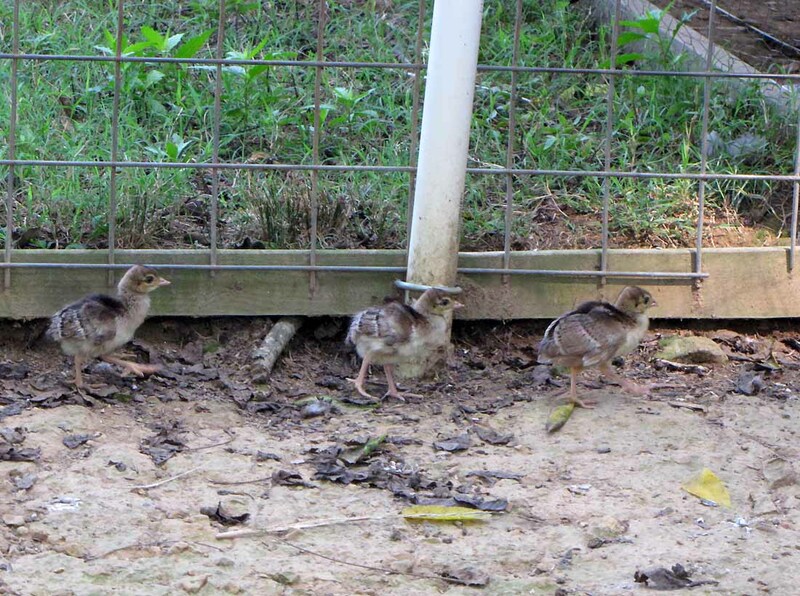 It should be interesting to see how many peachicks we get. 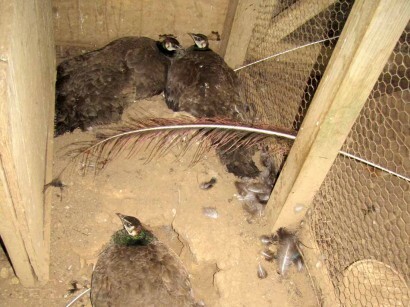 I’ve never had ALL our peahens sitting on eggs before! 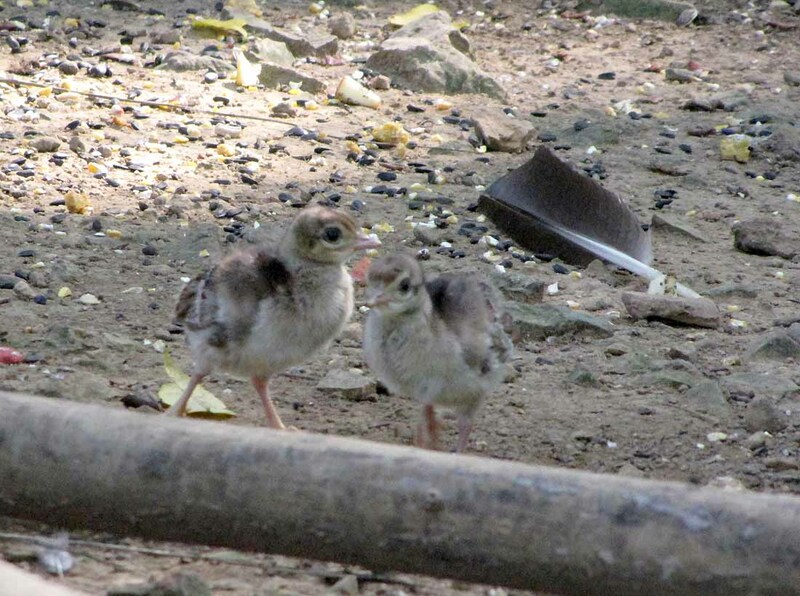 Newly hatched peachicks stumble around in the incubators looking a lot like T-Rexes or some other dinosaur with a long neck. I do wish another would hatch SOON though. The incessant peeping is driving me right round the bend. Yeah, yeah, I know I didn’t have far to go, but this little guy has LUNG POWER! Makes it hard to get to sleep at night when he’s in full chorus all night long! 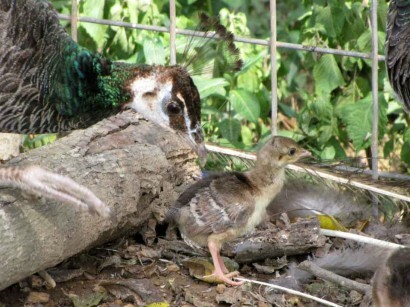 A couple hours ago I looked in an incubator to see one peachick almost out of an egg, and another just pipping. But a while ago I decided there sure was a lot of peeping going on, so I peeped too… peeped right in the incubator that is! Here’s what I saw: It’s the 3 Stooges! Or maybe it’s 3 little T-Rexes! What a nice surprise! I’ve got 2 peachicks in a brooder box already, and 3 more hatched out now in the incubator.